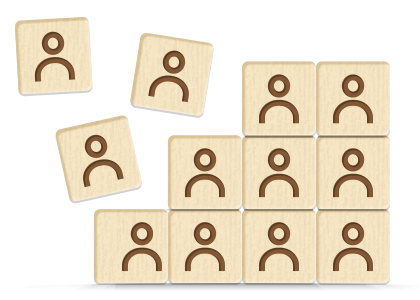 IDrive enables you to share multiple files over email with your friends or associates for collaborative access. Files from multiple computers and mobile devices, are backed up to the same account, which makes it easy for you to share them. You can collaborate by sharing files with your friends and associates to work on documents, etc. IDrive offers full office functionality on the web and your data stays encrypted. With the online document editing feature, once you share any office doc, the recipients can edit the file online in real time. All the changes done on the file are automatically saved, as they work. You can also share other file types for collaboration by giving 'can edit' permission, so the recipients can download the file, edit it and upload them again to your account. You can also simply share the files as 'can view' only. 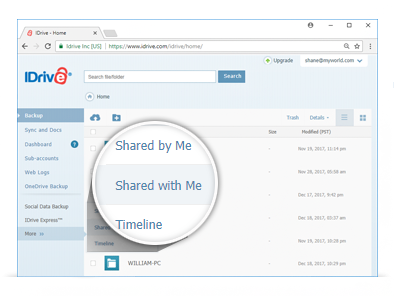 You can share files or folders stored in your IDrive account from your desktop, mobile device, or via the web - with anyone you wish, anytime, anywhere! Get the mobile apps for iOS and Android to share files from your mobile device. Login to the IDrive Online mobile app, select the files to share and tap the Share icon. Login to IDrive.com and click the 'Shared by Me' or 'Shared with Me' tab to manage all the files that you’ve shared and the files that are shared with you by other IDrive users!